The president wants the issue of housing for soldiers sorted out on a priority basis. President Vladimir Putin instructed the General Staff of the Russian Armed Forces on Wednesday to sort out issues related to housing for soldiers and the problems affecting garrison towns. Putin earlier described the issue of service housing as “eternal.” The lack of army housing has been one of its most pressing problems since the Soviet era, particularly following the withdrawal from the former Warsaw Pact nations in the early 1990's, despite a massive downsizing of the forces since that time. 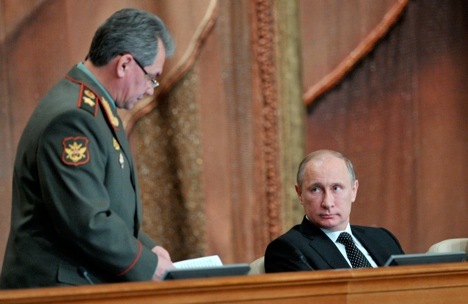 In a pre-election article, Putin promised to resolve the issue by 2014. As of December 2012, about 100,000 soldiers remained on the housing waiting list, according to Russian Audit Chamber head Sergei Stepashin. Putin also ordered the ministry to deal with infrastructure problems in garrison towns, where a number of power cuts and central heating malfunctions were reported this winter. The Russian armed forces are in the midst of a major shake-up, including a huge reequipment program, a gradual transition to fully-volunteer armed services, and organisational changes, in a bid to create forces more suitable for future challenges and less like the legacy forces left over from the Soviet era. As part of that transition, Putin said the share of new-generation weapons and equipment should rise to 30 percent by 2015 and to 70-100 percent by 2020. That process of change has met resistance from some elements within the services and arms industry, particularly during the tenure of former Defense Minister Anatoly Serdyukov, who was dismissed last November over a corruption scandal involving Oboronservis, a defense property management company. Commenting on Serdyukov's legacy, Putin said not all the decisions previously made on Russian military reform had proved to be useful, but constant shifts in the general course of the reform were unacceptable. “There should also be no constant flip-flops, no constant reversals of previously-made decisions,” he said. Putin also ordered the defence ministry set out a basic approach to defense policy for the period 2016-2020 by this year. “In 2013, the General Staff should define basic approaches and ideology of the country’s defense for the period of 2016-2020, and, within the next two years, this plan should be elaborated in every fine detail,” Putin said. He also instructed the defence ministry to complete its program to set up a strategic military planning system and submit it for approval in the near future.